For people in the Mozilla community, our mission is a clear focal point for everything we do. For others this mission can be hard to understand though. After all, the Internet is abstract and invisible and might not seem like something that would need protection. To make the mission clearer, we ran some campaigns that made a connection between the need to support special places in nature with the need to keep the Internet a special place online. 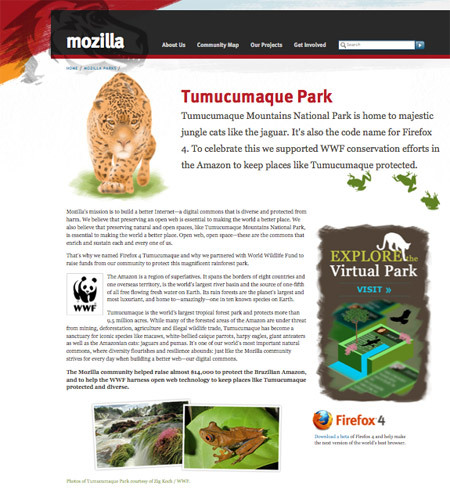 The Mozilla Parks program took this idea, added in cute animals from each habitat and asked people to make a donation. 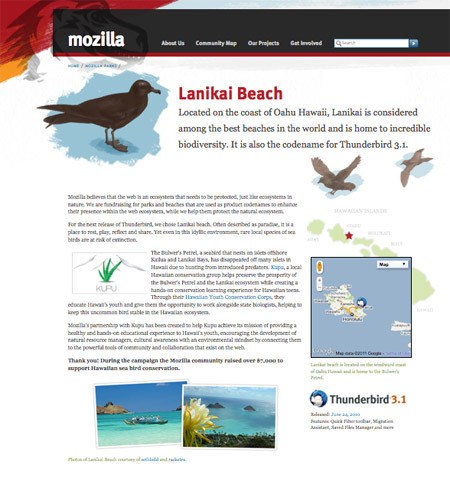 We did this for three parks tied to releases of Firefox and Thunderbird (Namoroka, Lanikai and Tumucumaque) and raised over $30,000 for non-profits that support those areas. There are no plans to do more park campaigns, although I think you’ll see other efforts to explain what Mozilla does by creating partnerships and links with other non-profits. Now that these pages are no longer being used they’re being taken down, but we wanted a place to archive them. Below are screenshots of each of the different pages. 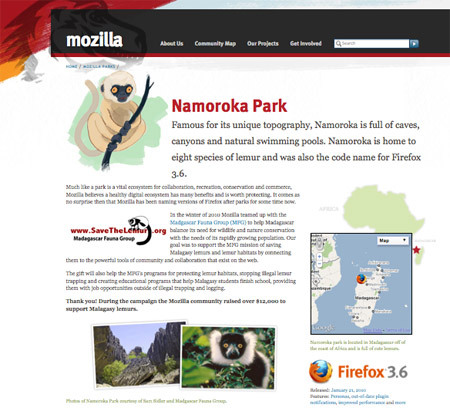 There is also a separate post with information about Mozilla Japan’s Discover Shiretoko site that inspired Mozilla Parks. Where in the office is Contributor Engagement? It’s not really clear in this post or in Chelsea’s why we’d stop doing this. I suspect it’s because in the rapid release cycle, we would need to pick a park every 6 weeks, which wouldn’t really have an impact? Also, we want versions to go down in our messaging, so we really don’t want to talk about them, or code names, if they still had some? The rapid release process does change things with the naming scheme of Firefox releases (with the new channels, a specific code name isn’t needed for each new release). It would still be possible to do other sorts of campaigns around parks even if it didn’t tie directly to a release though. Are these pages under version control anywhere? The screenshots are very small and the text is not accessible.